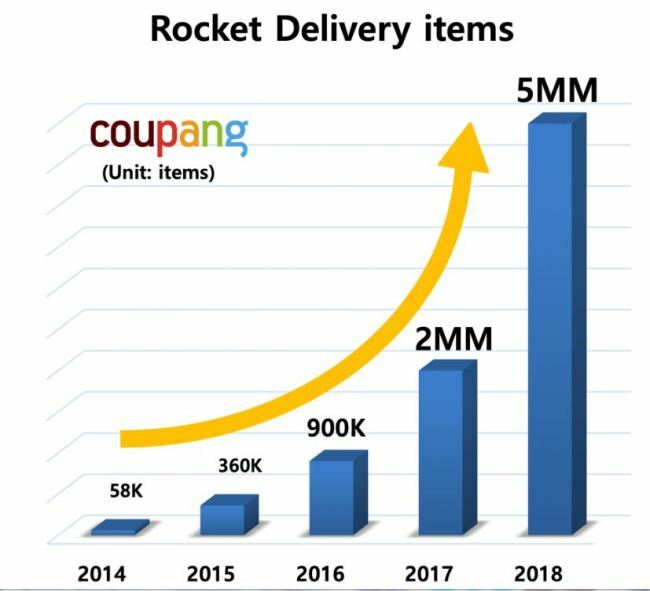 South Korean e-commerce company Coupang announced Monday its revenue for 2018 marked 4.42 trillion won ($4.1 billion as of the date of the report), posting 65 percent growth from the previous year. In its 2018 financial statements Coupang indicated that its operating deficit stood at 1.09 trillion won due mainly to its heavy investments. Throughout 2018, the company invested in its popular next-day delivery flagship service Rocket Delivery by expanding item selections from 2 million to 5 million items. That is 100 times more than the selection available at a hypermarket, the company noted. The company also hired more than 24,000 direct and indirect employees across the country, and increased the capacity of its fulfillment centers to 1.2 million square meters. Among several services launched in 2018, Rocket Fresh provides fresh food delivery by 7 a.m. for orders placed by midnight, and Wow Delivery offers same-day or next-day dawn delivery for 2 million selected items. Members of the Wow Club could even enjoy unlimited free shipping and 30-day free returns for 5 million eligible items. Coupang’s founder and CEO Kim Bom said, “We have made unprecedented investments to wow our customers.” He added that the company would continue investing in people, technology and infrastructure to make it an indispensable part of consumers’ life.